What Makes Court Moor Special? Court Moor aspires to be a special place, striving to be remarkable in a number of areas, but what is it that we think makes Court Moor that bit different from most schools? At Court Moor we believe in our staff and treat them like the dedicated professionals that they are. We trust that staff will set homework, feedback on students’ work and plan their lessons – unless there’s a problem we allow teachers to get on with the job without an oppressive monitoring and observation schedule. Court Moor has a very clear philosophy in how we treat each other, and how we expect to be treated. These are ‘our terms’. Parents are clearly told what our expectations are (see the Parental Code of Conduct) and any breaches are dealt with robustly. We run the school for the students, the parents and the community – not for Ofsted. Few, if any, decisions are made with Ofsted in mind, it is not a word that is used often in the school and we are secure in our path, regardless of the peccadillos of the latest schedule or the whims of a visiting inspector, we are values-led and those values drive our choices. Court Moor’s strength is undoubtedly its staff. We may not have the flashiest buildings or the most up-to-date facilities but what makes us stand apart is the genuine support between colleagues for each other and our openness to sharing our ideas and practice with others – both in and out of the school. 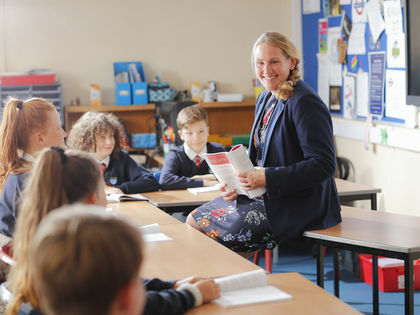 We pride ourselves on employing teachers who are warm and enthusiastic, because that is how you create a positive and dynamic learning atmosphere. We have looked at all our practices in order to minimise the workload implications for staff – as long as it doesn’t compromise the quality of learning for the students. We don’t complete written reports, we avoid excessive data drops and we avoid meetings for the sake of it. Our feedback policy is pragmatic, practical and focused on student improvement, not mindless marking. We have a member of staff with a paid responsibility for welfare, to put on those little extras – be it a massage or a yoga class – that just help people feel valued. Everyone looks forward to the termly ‘Free by Three’ day when staff are all offsite by 3.00pm, by order of the Head. We are working on more radical programmes yet to try and make somewhere where you can teach without losing your work-life balance. The staff at Court Moor are fascinated by the process of learning, we are regularly in each other’s classrooms: not monitoring but sharing; borrowing not judging. Our weekly Friday Takeaways, where teaching tips are shared, are presented by a range of staff and ensure the dialogue around teaching and learning permeates the school and the culture. Staff read about learning, talk about learning and think about learning. We strive to be ever better, everyone in the organisation aims to go beyond, to improve and ensure that in each aspect of school we will keep fine-tuning what we do to make the experience of school the very best it can be. Court Moor aspires to be different, we want to take traditional problems and turn them on their head. We actively develop new and interesting ideas, trying things out for the first time – rather than copying something done elsewhere. It helps to create a dynamic school and a team who are always up for the next challenge.